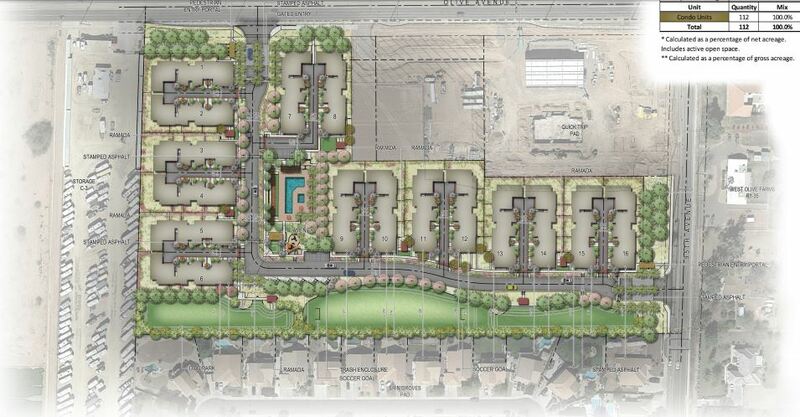 Pew & Lake, PLC, on behalf of developer Bela Flor Communities, LLC, submitted a General Plan Amendment and Rezoning request to the City of Peoria for a new 16-buildng condominium development on 12.79 acres. The property is located at the SWC of 95th and Olive avenues and is bound by a QuikTrip and a proposed Francis & Sons Car Wash to the north, single-family residential to the east and south and an RV and Mini Storage facility to the west. The applicant requested an amendment of approximately 12.79 acres from Low Density Residential to Medium-High Residential, and a rezoning to allow multifamily residential. Both requests were approved at the March 7 Planning and Zoning Commission meeting. The project, named Bella Olivia, is planned as a 112-unit gated condominium subdivision housed in 16 unique 7-Plex buildings. Each building will be two stories with a maximum building height of 30 feet. Unit sizes will range from 831SF to 2,140SF and will range in price from $175K to $375K. Each unit will have its own attached, enclosed garage. “The large amenity area will be located in the center of the subdivision with easy access from all condominiums,” according to the applicant’s submittal. “The amenity area will feature a pool, covered playground equipment, shade structures and barbeque areas.” Additionally, there will be active open space along the entire southern boundary that can provide amenities such as a dog park and shade structures. The building style is designed as mid-century modern with the use of neutral colors to “assist in accentuating changes in massing.” The distance and configuration of the lots will allow the design to act as a buffer between the single-family homes to the south. There will be two points of access to the gated community. The first will be on 95th Avenue and the second on Olive Avenue. There will be a total of 307 parking spaces provided and on-street parking will also be available. A request made by BEX researchers regarding a city council hearing date has not been returned by press time.